Today is National Chocolate Éclairs Day! So… Happy Chocolate Éclairs Day! I recently added the National Food Day (you can get it here!) calendar into my Google Calendar to motivate myself to bake/cook more new dishes and to revisit some of the old favourites that are in a dire need of a revamp (seeing some of the old photos, like this one, just make me cringe). It’s important to have all the ingredients ready when making the choux pastry. 1) Using softened and chopped butter and low heat at the start to cook the milk mixture prevents excess water evaporation. 2) The flour must be added all at one go into the boiling milk mixture otherwise you will get lumps. 3) When cooking the choux pastry, a film of choux will form at the bottom – do not scrape up this film as it will result in cracks in the choux during baking. The final choux dough should droop down from a spatula / wooden spoon to form a V-shape. If the choux is still too stiff, it will be very hard to pipe the choux later on and you will end up with a lot of tips. If needed, mix in milk, tablespoon by tablespoon, until the right consistency is obtained. The right piping tip is essential. Use a 12 to 15-mm open star piping tip. You can also use a 12 to 15-mm plain nozzle instead. 1) Either use a ruler as a guide or make markings – I dipped an oiled scraper into flour and mark it on the silpat. I then piped the choux right next to the line I made so that the choux is straight. 2) If the choux is of the right consistency, there is no need to apply much pressure to squeeze the choux out. 3) Don’t squeeze the choux too thick or you will get a very fat éclair which will look ugly. Aim for a choux about 15-mm thick. 1) Misting the surface of the choux with water helps the choux to rise better. 2) I don’t dab the choux with egg wash or anything else as it flattens the choux, creating a fat and ugly éclair. 3) The choux must be baked at a higher temperature first so that it will rise. Once risen to the max (about 20 minutes), the temperature is then lowered to dry the interior of the choux (another 20 minutes). 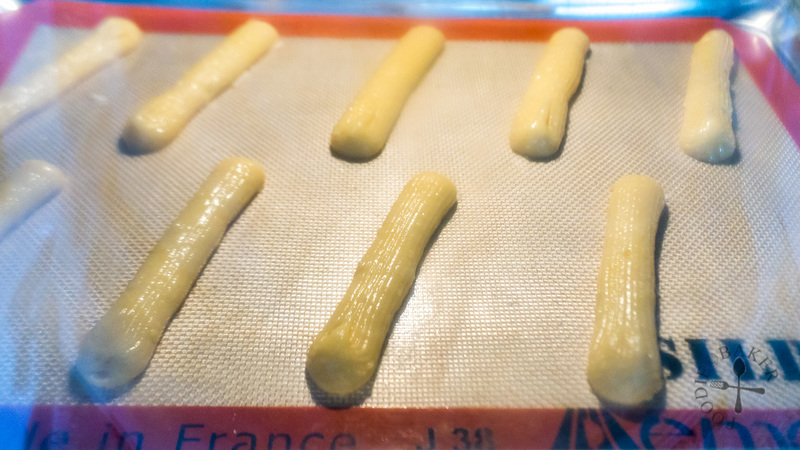 It’s important to dry the choux completely so that the the éclairs will not become soggy. The Chocolate Éclairs I made today have triple chocolate in them – first in the creamy pastry cream, second in the luscious dark chocolate ganache and lastly topped with some white chocolate shavings. It’s sooo good that I’ve already eaten 4 today and my friend finished up all 3 that I passed to her, so you can be assured this is a damn good Chocolate Éclair that is worth all the calories. Happy Chocolate Éclairs Day once again! I’m aiming to celebrate Chocolate Pudding Day which falls on 26 June next, join me if you can! Preheat oven to 180C / 355F. Line baking sheets with parchment paper or silpat. Have all the ingredients measured and ready. Combine milk, water, butter, sugar and salt in a pot. Heat the mixture over low heat until all the butter has melted. Turn up the heat to high and bring the mixture to a rolling boil, stirring occasionally with a wooden spoon. 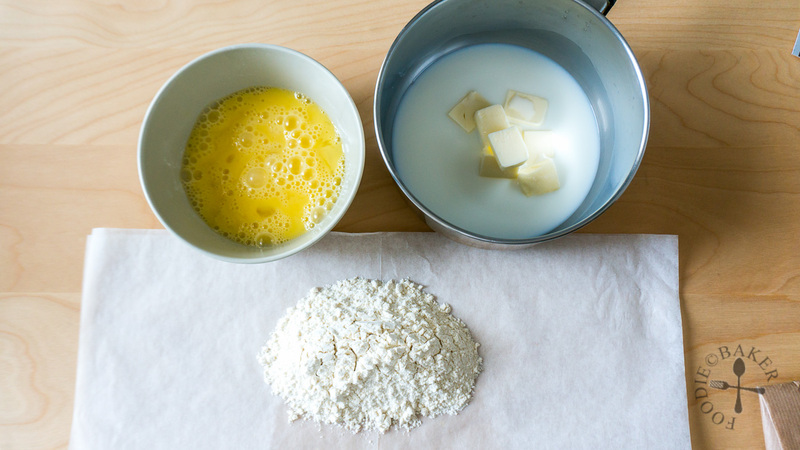 Immediately remove the pot from heat, add in the flour in one go and stir quickly and vigorously with a wooden spoon to mix in all the flour to form a dough. Once all the flour has mixed in, return to medium-low heat and continue cooking the choux, mixing with the wooden spoon to dry out the dough a little bit. The dough is ready when a thin film of dough forms at the bottom of the pot. Do not scrape the film of dough formed at the bottom of the pot up. Remove the pot from heat and transfer the dough into a clean mixing bowl and let cool for 5 minutes, stirring occasionally. Using an electric mixer on low speed or with the wooden spoon, add in the beaten eggs in 4 parts, mixing well after adding each part of egg. The choux batter is ready when it will drop down from the beaters or the wooden spoon and form a "V" shape. 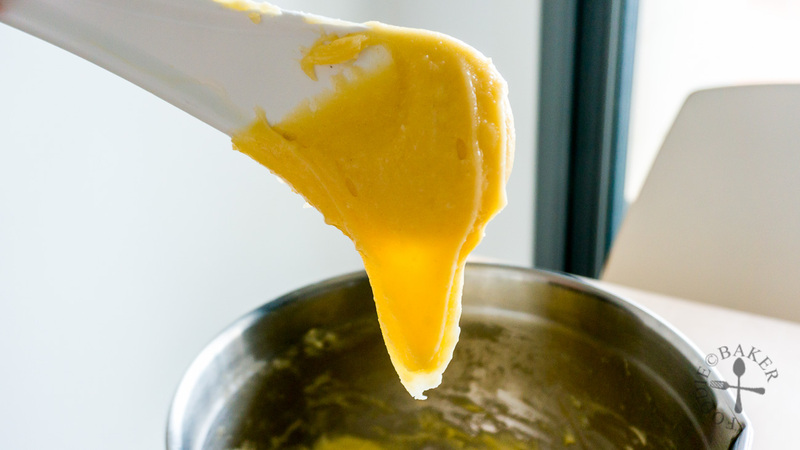 If the choux batter is still too stiff, beat in milk, tablespoon by tablespoon until the right consistency is obtained. Transfer the choux into a piping bag fitted with a 12 to 15-mm open star tip. Pipe 12-cm long strips of choux, ensuring that each strip is straight and of the same thickness, about 15-mm thick. 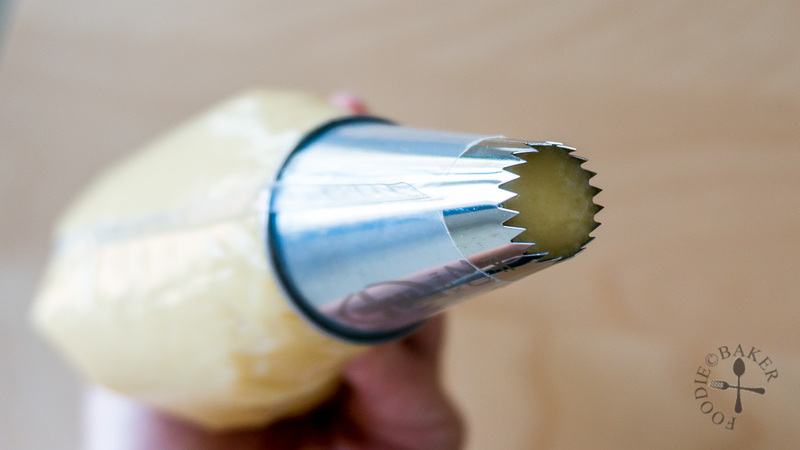 Using a spray bottle, mist the surface of the piped choux with water. Bake at 180C / 355F for 20 minutes, until the dough is well-risen - do not open the oven door at all during this period to check on the choux. Reduce the heat down to 150C / 300F, open the oven door to release the steam and close the oven door. Bake for another 20 minutes until the choux is dry and crisp. Remove the choux from the oven. Using a knife, stab 3 small slits on the underside of the choux to release excess steam. Transfer to a wire rack and let cool completely before filling with pastry cream. Make the pastry cream up to Step 4 before making the choux pastry or while the choux are baking. 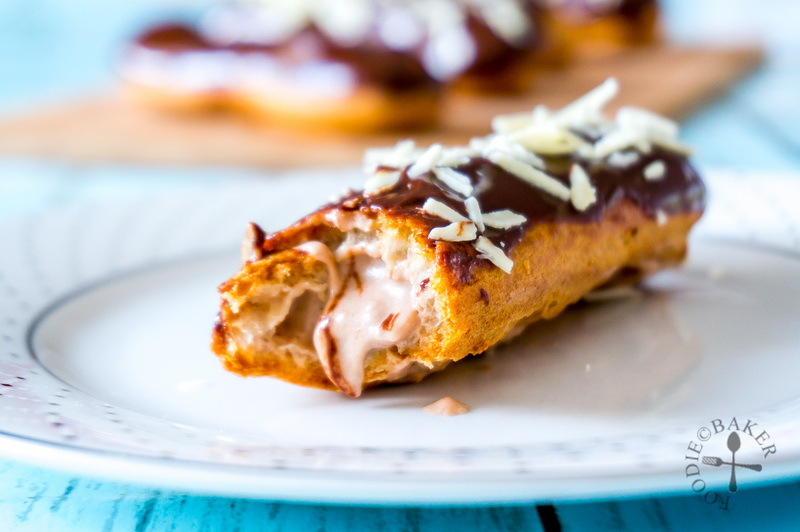 The cream should only be whipped and folded in when the Dark Chocolate Ganache is ready for dipping and the éclairs have cooled down completely. Whisk 45 grams sugar, egg yolk and flour in a small mixing bowl. Set aside. Heat milk in a pot with the remaining 5 grams of sugar until it starts to simmer. Pour the hot milk in a thin stream into the egg-yolk mixture while whisking continuously until all the hot milk is added, making sure to scrape the bottom of the bowl to mix everything thoroughly. Pour the milk and egg yolk mixture back into the pot and cook over medium heat, whisking constantly. The mixture will be thin and frothy with lots of bubbles on the surface but it will soon thicken. When the mixture starts to thicken, remove the pot from heat and whisk rigorously until the mixture is homogenous. Return the pot back to the heat and whisk constantly until the pastry cream boils - big bubbles will start popping out of the pastry cream. Remove the pot from heat and add in butter, vanilla and dark chocolate. Whisk until the chocolate has completely melted and the mixture is smooth. Scrape the mixture into a clean bowl (the larger the better, so it cools down faster.) If there are lumps, strain the pastry cream through a sieve. Press a piece of parchment paper or plastic wrap onto the surface of the pastry cream and chill completely in the refrigerator, about 1 hour. Proceed to make the Dark Chocolate Ganache at this point. Whip the cream (either with a hand mixer or manually with a wire whisk) until semi-stiff peaks are formed. Remove the pastry cream from the refrigerator - it will be quite firm at this point so use a wire whisk and whisk gently to make it smooth. Don't whisk too much as the pastry crema will become watery. Gently fold in the whipped cream. Transfer the chocolate pastry cream into a piping bag and use it immediately. The ganache should be ready for dipping before the éclairs are filled so you can dip the éclairs immediately after filling them. Microwave Method: Combine chocolate and cream in a heatproof bowl. Microwave on full power for 20 seconds. Stir the mixture. Repeat until the chocolate has completely melted and the mixture is smooth. Stove Method: Place chocolate in a heatproof bowl. Heat cream in a small pot until simmering. Pour hot cream over chocolate and let stand for 5 minutes. Whisk until mixture is smooth. Let ganache cool until room temperature before using. If the ganache looks oily, whisk in hot milk, teaspoon by teaspoon, until mixture is smooth again. Use a small piping tip and poke holes on the underside of the éclairs. 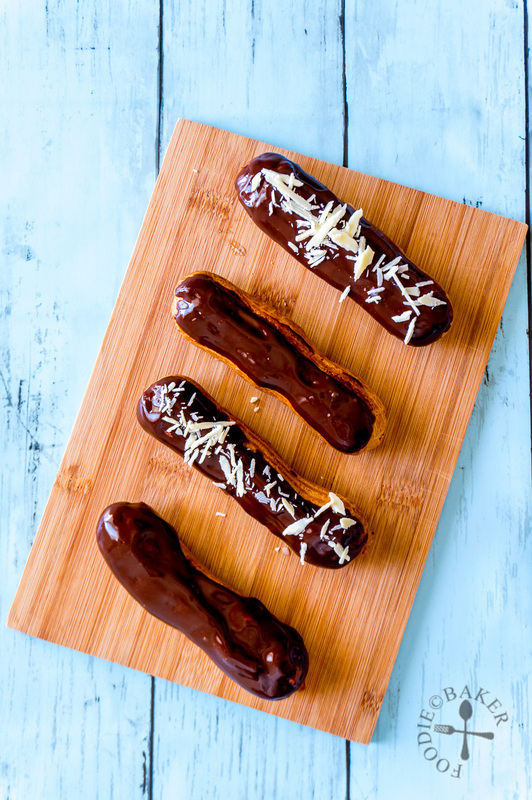 Pipe Chocolate Pastry Cream into the éclairs and dip the tops in Dark Chocolate Ganache. 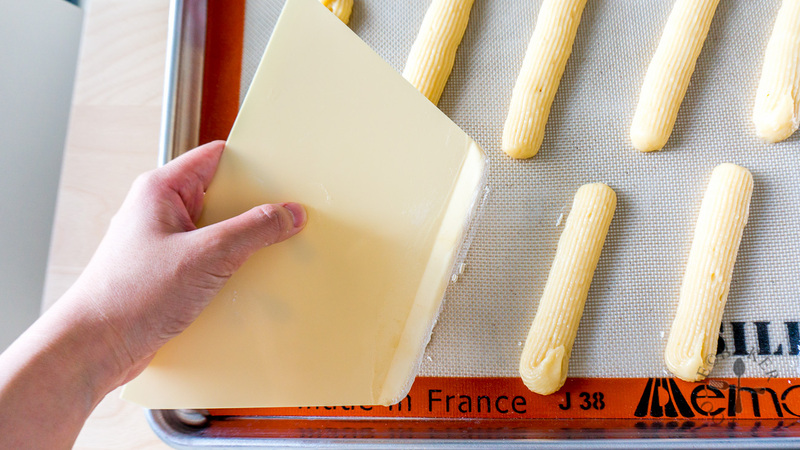 Shake gently to remove excess ganache and place the éclairs on a baking sheet. Sprinkle with white chocolate shavings. 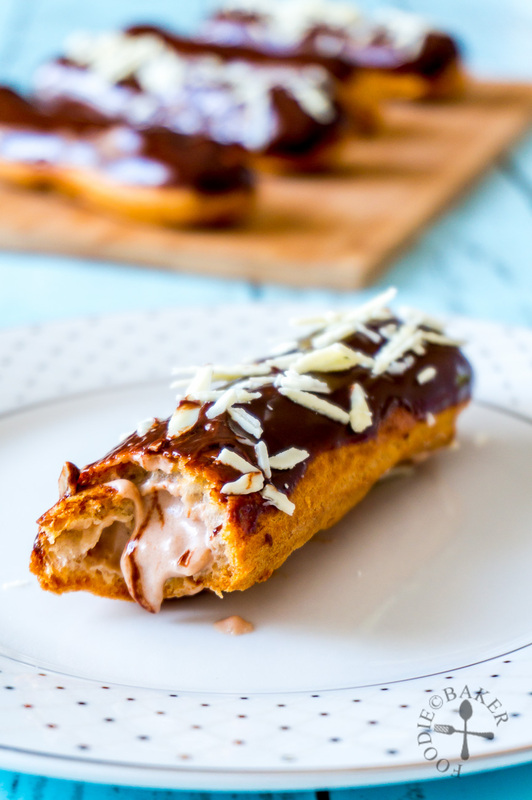 Store the éclairs in the refrigerator until ready to serve - they are best eaten on the day they are made. 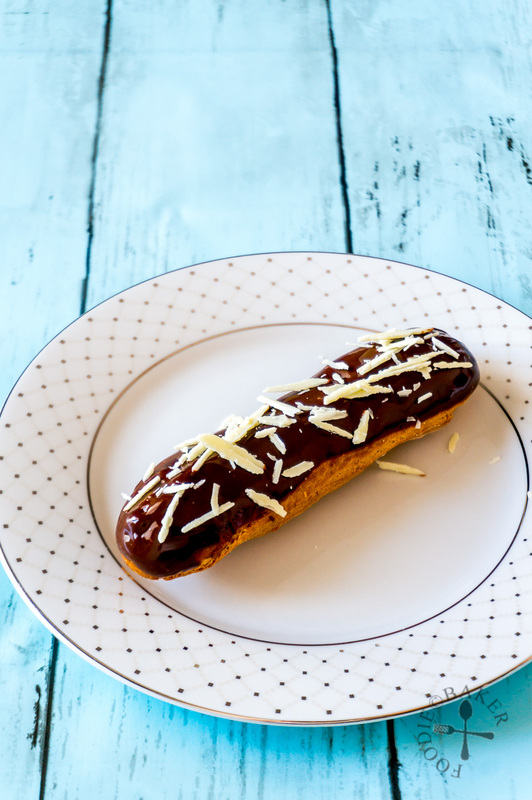 Any leftover éclairs can be stored in an airtight container for 2 to 3 days - they will still taste good, but the choux will be softer. Oh! These eclairs look awesome! They are so long, and the filling looks delicious! 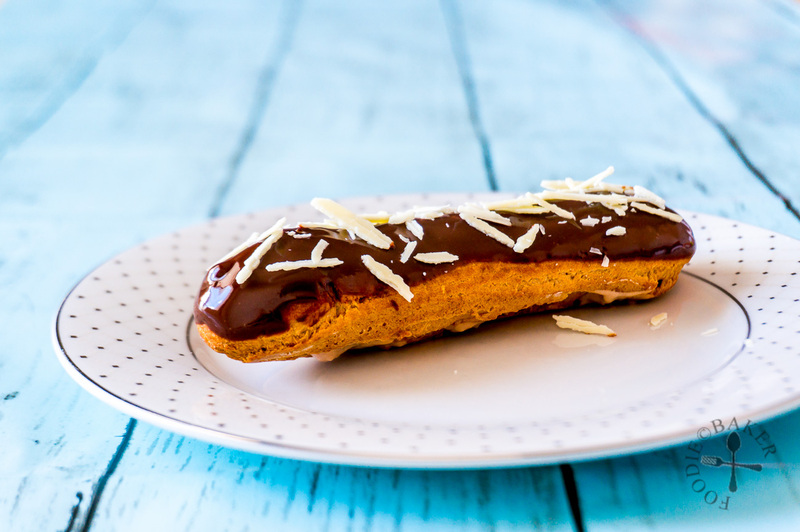 Happy Chocolate Eclairs Day! Didn’t know there is such a day, haha. Never mind, as long as we have a reason to make something yummy to indulge in, we will celebrate the day! Thanks for sharing. Haha I never knew there’s such a day too, I wonder who created this day?? But yes, sometimes we just need that reason to make something to indulge in, glad you like it! Hi Anna! Yea I have no idea who created it but I’m glad he or she did 😉 Hope you will make some eclairs soon, they are sooo addictive!